As my parents and I drove all day on Saturday, the only thing I could think of to be happy about was the prospect of seeing the B-52’s. Everything else seemed so depressing (to me, at least). Everybody keeps telling me how great college is, and that I will love it, but I wasn’t convinced. I was moving away from the people I loved most to go to a school I wasn’t 100% sold on. Why on earth would I be happy? Upon my arrival at Tropicana Field (not as weird as seeing a band play in a dumpster, but still pretty odd), I started to feel a little bit of excitement, though. The baseball game had just finished, and we had managed to get wristbands from my uncle, who had gotten them from a friend, knowing how badly I wanted to see the concert. We bought an additional ticket, and headed to the entrance, thrilled that we were about to see a group of legends. We get to the doors, and they ask for our tickets. We oblige, showing our wristbands, and then are told that they won’t let us in. Um, what? Apparently you need tickets to get in, and the wristbands only allow you to go down on the field rather than just sit in the stands. Well, that brought about mixed feelings to say the least. My dad and I were already wearing the bands, so we ran back to the booth and bought two more tickets before joining my mom in the lobby. After a short conference, it was decided that it was insane for all of us to miss out on seeing the B’s right up close, so dad and I headed down below while mom headed to find a decent seat to watch the screen. As we stood in line, I could hear the beginnings of “Pump It Up,” from the new album Funplex, over the loudspeakers. I began to silently curse the people in front of me, with their party horns and cowbells, who were clearly only there because it was free with admission to the game. Luckily, we managed to get on the field before the song was over and I ran to get closer, singing along at the top of my lungs. There were quite a few people, and finally I could tell that some of them were actually there for the music. I whipped out my camera and got a few shots before succumbing to the music and just dancing for a while. It was exhilarating, and it’s hard to believe that Kate, Cindy, Keith and Fred are still so exuberant after all these years. But they are. It seemed like nothing could stop them. Speaking as somebody who rarely does more than sway to the music at concerts, I found it impossible not to dance like a maniac as they ripped through song after song, both old and new. The high point of the night for me came towards the middle of the set. Cindy announced that they were playing a song from Wild Planet, and Fred brought out some sort of glockenspiel. I quickly tried to remember if “Give Me Back My Man” featured that curlicued instrument, and grabbed my camera just in case. It’s one of my absolute favorites, and I knew that Jordan would kill me if I didn’t get it on tape. As Cindy announced what confirmed my suspicions, I couldn’t help but freak out a little bit. I had first heard this song on an old WUOG broadcast with the ever charming Mr. Mills and Mr. Buck, and at that point I fell in love. After Mills played it on the Sled Ride to Hell, I knew it was one of his favorites too, and I can’t lie, that made me love it a tiny bit more. Ever since, it has become a bit of a joke between me and the boss lady, and I can almost guarantee that if you hear it on WUOG some Tuesday night, it’s because I demanded it. As I held up the camera and my arms grew more weary, my phone began to buzz in my pocket. I refused to stop, and instead told dad to check his phone to see if it had been mom. It was, and she had good news. She had managed to track down a wristband and was out on the field looking for us. As dad wandered off, I stayed glued to my spot, bouncing ever so slightly and singing at a level I hoped wouldn’t be picked up by the camera microphone. In the end, I had a shaky video that didn’t have the greatest sound quality…but I couldn’t care less. I had my video and I could relive that moment whenever I wanted to. “Hot Corner” also brought about excitement simply because I love the song, but at the same time there was a touch of sadness as I danced along. I had wanted to go to UGA and spend my time on the Hot Corner, but here I was in Tampa, on my way to Sarasota to move into my dorm, hours away from Athens. As the song progressed I considered what could have been, and couldn’t help but smile a little bit. 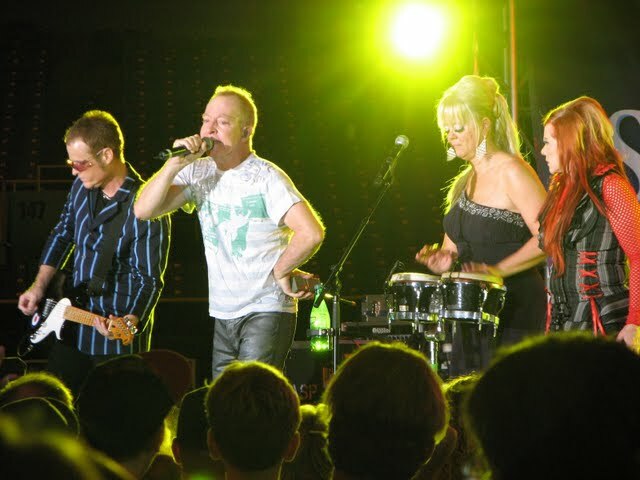 If I had been moving to Athens this weekend, I wouldn’t have been watching the B-52’s. Sure, I would have been able to see tons of awesome bands, but hey – there’s always grad school. The set was starting to wind down when they (finally) played “Love Shack.” I had been anticipating it the entire evening, and was hoping that it wouldn’t be their final song. Don’t get me wrong, I love “Love Shack,” but it’s a bit predictable. It was obvious by the way that the whole crowd began to shake that they too were finally hearing the song they had been expecting. As soon as the song was over, people began to flood out of the stadium, and I was more than a little shocked. The show wasn’t over, but all of these baseballs fans decided it was time to go because they had heard the one song they could recognize. “Love Shack” was followed by “Planet Claire,” which was absolutely amazing (especially Kate’s part), and “Rock Lobster” wrapped up the evening. By the way – Cindy can still make some pretty convincing dolphin sounds. With my ears ringing and that catchy guitar line from “Rock Lobster” still playing in my head, I fought my way to the front of the stage hoping to get a set list, only to see a girl a few feet ahead of me get the last one. I was a little disappointed, but it was nothing in comparison to my excitement. Maybe this was a good omen. I had managed to take this occasion that I was sure would be fraught with nothing but fear and sadness, and made it into something special. The next day, as I moved into my dorm, I had “Roam” stuck in my head. Somehow it seemed appropriate as I took off into this new phase of my life where I was in control. As I put up posters and old photos, I finally felt like I was ready to roam around the world.